The Toolkit is a comprehensive set of conceptual and concrete tools for exploring Jewish Peoplehood with a diverse range of students. There is no single, or correct way to use these materials; we hope you will experiment with the different components. Below we offer a few suggestions for ways to organize your use of the Toolkit. Please let us know what you do with the Toolkit, how it worked for you, and what we can do to improve it! Read through the Themes. We suggest that you build a short unit on each of the themes, using the related Programs, Resource & Materials. Don’t forget to include some kind of Mifgash (either virtual or in-person). Take a look at the Peoplehood Papers, in the Virtual Library. Ask your students to put together their own version of the Peoplehood Papers as a final conclusion of the course. Read the Pedagogic Overview and consider what outcomes you want from the sessions you are planning. Choose two or three of the most relevant themes. Spend one session on each of the themes using either the introductory activity or one of the text-based activities (in Programs, Resources & Materials). Organize a virtual or in-person Mifgash. Develop a project for the students, using a social media tool, so that they can process what they are learning and share it with others. Read through the Conceptual and Pedagogic Overview sections. Read through the Mifgash section of Peoplehood Practices. For one session, review the the different themes and choose one. Use one of the introductory activities (in Programs, Resources & Materials) that seems most engaging. For the other session try and arrange a Mifgash with Jews from a different culture or background. Welcome to the Jewish Peoplehood Education Toolkit, a project of the Center for Jewish Peoplehood Education, with the support of the UJA Federation of New York. The Jewish Peoplehood Education Toolkit is a comprehensive resource for Jewish educators and community leaders who are interested in engaging their students and constituents with questions of Jewish collective belonging, global community and mutual responsibility. We believe that being part of an ancient, global people offers Jews from all backgrounds and of all ages an immeasurable opportunity to experience the richness of Jewish civilization, history and culture. If you are a teacher or community leader and you want to help your students, campers, colleagues (or even yourself) feel more connected to the Jewish People and motivated to take an active role in shaping its future, you have come to the right place! WHY is teaching about Jewish Peoplehood important and relevant? HOW do I teach my students to feel part of the Jewish People? 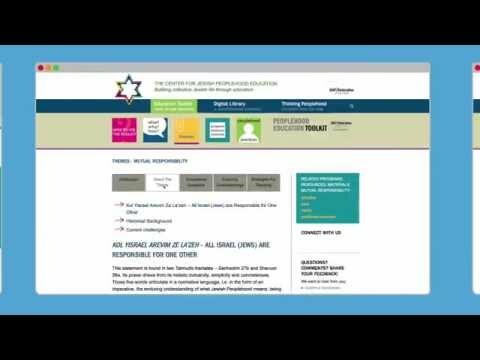 WHAT is included in Jewish Peoplehood Education? Each theme includes an introduction, conceptual explanation, related educational questions, enduring understandings, strategies for teaching and more. Each theme also has a section in the Programs, Resources & Materials section. You could build an entire curriculum around the themes, or just focus on the one (or two) that are most interesting to your students. For each topic there is at least one introductory activity and at least two text-based activities. There are also media resources and links to other materials that are related. The activities can be used with a range of ages and in different settings. Feel free to build them into a longer curriculum or pick and choose what works best for you. It’s important to us to allow educators in the field to input their own lesson plans, allowing us to create a user-driven program bank. Click here to submit your own lesson plan. The Peoplehood Practices are a series of methodologies that are effective in building a Jewish Peoplehood consciousness. Whether it is through the use of travel, people-to-people meetings (Mifgashim), focusing on Hebrew language or using social media effectively – all these practices should be part of the toolkit of the Peoplehood educator. In the Peoplehood Practices section of this site, you will find best practices, resources, links to useful ideas and much more. The Digital Library is an entire online collection of writings about Jewish Peoplehood. There are articles about all aspects of Jewish Peoplehood, from the Center for Jewish Peoplehood Education and other sources. The materials here can enrich any course or activity on the subject, and will offer a multi-vocal approach to Jewish Peoplehood.